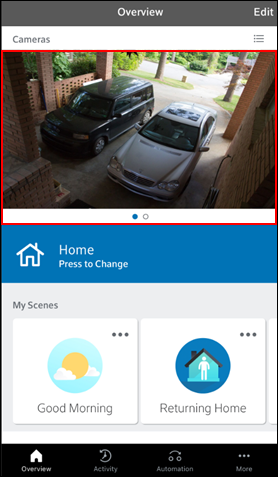 The Homelife mobile app allows you to access your Continuous Video Recording (CVR) activity. 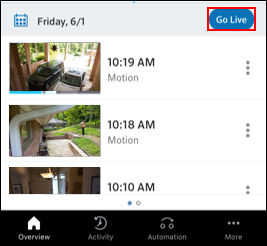 Through the Homelife mobile app, you can view and navigate through recordings via a timeline, calendar, and recorded motion events, as well as save video clips directly to your mobile device. Note: Ensure you have Homelife mobile app version 9.1.1 or later. Check your mobile app settings to see your current mobile app version. You can download and update the Homelife mobile app free from the Apple or Google Play app store. Follow the steps below to access your CVR activity. From the Overview screen, swipe through the camera carousel to view feeds from each of your cameras. 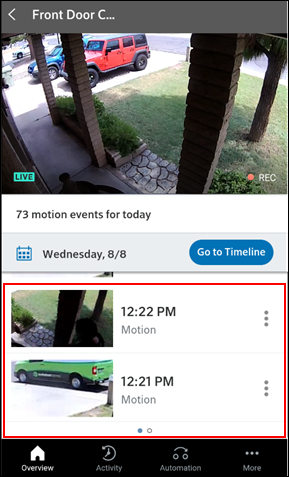 On the Camera screen, tap the camera feed to display all of the motion events from that camera. From the Camera screen, tap Go to Timeline to view a timeline of motion events from that camera. 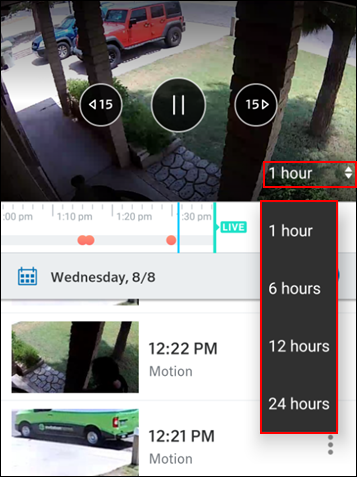 On the timeline bar, swipe the screen to move to the desired time to view recorded video clips. 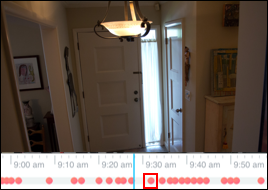 The timeline on the Camera screen displays red dots, each red dot indicates recorded video clips. 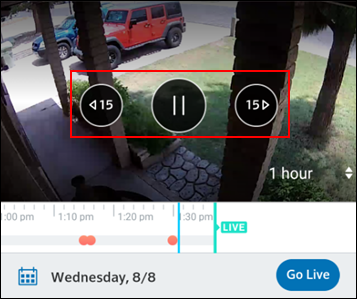 To view a recording from a specific point on the timeline, scroll to a red dot on the timeline to play the recorded video. On the Camera screen, tap the camera feed image to display the Pause, Rewind, or Fast Forward buttons. Tap the buttons to pause, rewind, or fast forward through recordings. On the Camera screen, follow the steps below to configure the timeline length. Tap the time value in the bottom right of the screen. From the drop-down menu, tap the number of hours for the length of your timeline. To view recordings from a specific date, complete the following steps. 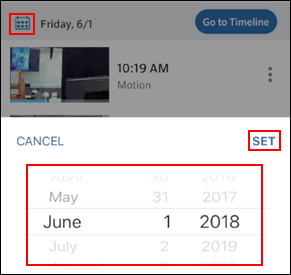 From the Camera screen, tap the Calendar icon. From the drop-down menu, tap the date you would like to view. Note: You can view recorded video clips from the past 10 days. From the Camera screen, complete the following steps to save a video clip to your mobile device. 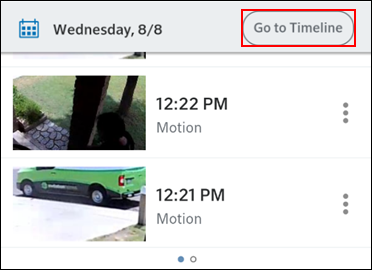 Select the motion event you would like to save. 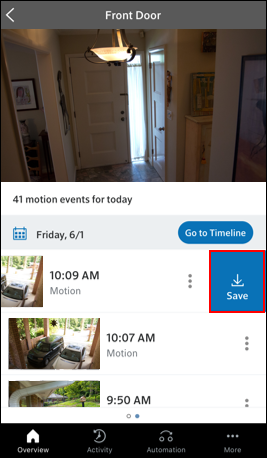 Place your finger on the motion event tile and swipe left to display the Save icon. 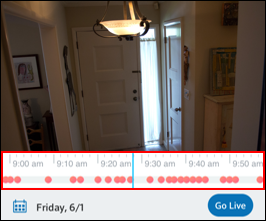 From the Camera screen, tap Go Live to return to the live camera feed.